With the purchase of my IC-7400 back in 2013 I started to look for ham radio software that would perform the dual purpose of logging system and rig control, as I also got hold of a USB based CI-V cable (Beginners: This is a cable used to control the radio from a PC) not longer after acquiring it. As a third objective, the CI-V cable also came with a second set of cables that routed the necessary audio between the radio and computer, therefore I was quite keen to play around with the numerous digital modes on HF. After evaluation of a number of software packages, two programs were chosen for daily use. 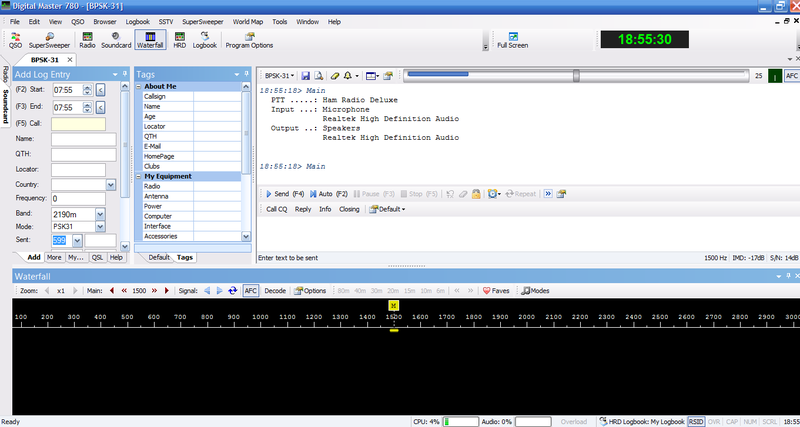 Ham Radio Deluxe - this is used for Rig Control, Logging, Rotator headings and a number of digital modes. JT-65 HF - this program is used for the JT65 on HF. Ham Radio Deluxe is now into version 6.x and has become a fully commercial, paid-for piece of software. I have not purchased the full version nor downloaded the trial of version 6.x so I cannot make any comment for that version of HRD. From what I read it builds on version 5 and includes lots of fixes. HRD LLC. offer a free 30 day trial of the software with a purchase required if you intend to continue using the software thereafter. You can download the last free version of Ham Radio Deluxe, version 5.24 from this site. The installer is no longer hosted on the HRD commercial website, it was taken down some time ago, so I have uploaded it onto this website so that you may install it for use. The file is a self-installing executable, for the Microsoft Windows operating system. Click here to download the Ham Radio Deluxe version 5.24 installer. Note: This software is offered as-is for you to download, I cannot provide any assistance or support with it.